There’s no shortage of things to do with kiddos in Bull City. The city is impressively kid-friendly and we tote our toddler with us to most activities and restaurants (unless it’s past his bedtime). For a family that appreciates both urban and natural outdoor adventures, the possibilities in Durham are endless. Indoor, outdoor, and by the season. We’ve got you covered. Whether it’s your kiddos or you’re hosting visitors, these activities are sure to be crowd pleasers, for both them and you. Here are some of our favorite family-friendly activities in Durham! The Duke Lemur Center houses the world’s largest and most diverse collection of lemurs – Earth’s most threatened group of mammals – outside of Madagascar. Note: You must have a reservation in order to see the lemurs, check out some of their tour options on their website here. We like going to their annual Lemurpalooza event that usually occurs in the Fall. It costs only one $75 Adopt a Lemur donation per car and it comes with a lemur adoption. A 4,200-acre North Carolina state park, it’s only 10 miles from downtown Durham but it’s one of the best places in Durham to get away from it all. The hiking trails are well-marked and there are some very nice hikes from flat trails as well as hilly areas. Take the kiddos canoeing, fishing, hiking, and even camp overnight! Once a tobacco factory, the American Tobacco Campus is home to the famous Lucky Strike Tower so many identify with Durham. It’s truly beautiful with a river running throughout the campus and a large green space. Play a game of Bull City chess, lounge in hammocks, check out the Burt’s Bees house, relax in the rocking chairs under the Lucky Strike Tower. Check out the free music concerts on the lawn in the summer! West Point on the Eno is free 404-acre park along the Eno River. Tour three historic buildings, a rebuilt operational grist mill on the site of what was once the largest mill on the river, the house of the one-time mill owners, and the old tobacco packhouse is now home to the Hugh Mangum Museum of Photography. Explore nature too with five miles of scenic trails along the river for hiking and fishing, an amphitheater used for festivals and concerts, and the river itself, with a natural play space and rapids. Hop on American Tobacco Trail for 22+ uninterrupted miles. It was once a railroad track that was converted into a beautiful trail for biking, walking, and running. You can even ride horses on the trail! See more about American Tobacco Trail here. Named one of the top 10 public gardens in the U.S. by TripAdvisor, Sarah P. Duke Gardens is open everyday of the year and is free to all! Explore with the whole family at Ellerbe Creek Family Explorers Club! The Club meets one Saturday of every month at different natural areas in the community. It’s open to all families in Durham and surrounding communities. Children and an adult family member attend together. The 13-element low ropes course is located in the wooded area adjacent to the historic Spruce Pine Lodge and Lake Michie in northern Durham County. At the low challenge course, staff facilitators use a variety of natural and man-made elements, games, and initiatives to help groups and individuals develop trust, cooperation, teamwork and leadership skills. The minimum age for participation at the low challenge course is 10 years of age. Saturdays at the Durham Farmer’s Market is one of our favorite activities. We pick up dinner for the weekend, try lots of local goodness, grab coffee from Caballo Rojo, donuts from Rise, and browse vendors at the Art Market. Then you can let them run some of that energy out at Mount Merrill and play with the interactive pixel mural. There’s definitely not a shortage of parks in Durham, that’s for sure. You can find a sprayground at the Forest Hill’s park, a performance stage at Burch Avenue Park, and a community garden at Orchard Park. A few favorites are Forest Hills Park, Trinity Park, and Cornwallis Road Park. 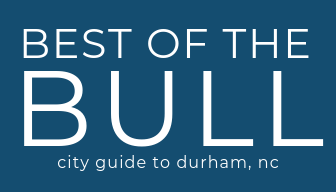 Check out all of Durham’s 65+ parks here. Brightleaf is a great place to spend an entire afternoon. You have some great options for lunch including Clouds Brewing and Little Dipper Fondue. (They’ll love dipping things in cheese, because don’t we all?) You can shop at spots like Indio and Song of Sixpence then grab some ice cream and coffee from Pine Cone. They serve the very famous and very delicious Maple View Farms ice cream. There’s a lot to do downtown, check out our guide of places to eat, drink, and explore. When you need a little break from exploring there’s some climbing blocks in front of the Durham Art Council for the kids while you get 5 minutes to rest and drink that coffee. Home to the biggest surrender of the American Civil War troops, Bennett Place Historic Site offers guided tours. Along with the museum, there are walking trails, outdoor exhibits and a picnic area for you to enjoy. Northgate Mall has a carousel in the middle of the mall that’s a lot of fun for the kids to ride on. It’s also next to Cinnamonster so you can get a treat for everyone afterwards. The play area at Southpoint is geared towards younger kids. There’s a small slide and some low-to-the-ground climbing objects, plus benches line the area so you can take a load off. The mall does have free wi-fi so you bring your laptop and work a little while the kiddos play. One of the negatives is there’s not a gate so kids can tend to want to wonder off in the direction of the escalators (aka my kid) so be sure to keep an eye on them. Defy Gravity is a 13,000 sq. ft. trampoline park with wall-to-wall steel-frame trampolines including Angled Wall Trampolines, an expansive Olympic Foam Pit and one of the largest Trampoline Dodgeball cages in America. There is a kid jump time for kids 6 and under, $8/kid and parent jumps free- Monday-Friday 9am-12pm. Notasium is an indoor music-based play space. There’s a climbing wall, interactive music exhibits, and a bounce house. Free wi-fi for you and a small coffee bar. Bonus: Get free open play with a trial music lesson using your Shop Durham card. The Scrap Exchange is a true treasure. They have a retail store, classes, an art gallery. Drop in and check out the Make n Take Room, make anything you want using the materials in the space, and take it home! Wheels Fun Park has an indoor climbing gym, games, mini-golf, go-karts & a roller rink. Our favorite branch is the Southwest Regional. They also have a train table and coloring station for the kids. Most Durham County Library branches offer storytime for babies, toddlers and families. These aren’t your traditional book-only storytimes, instead they incorporate music, puppets, toys and learning throughout the session. A locally owned art supply and craft store that also has classes! You can drop in and do a craft with your little ones or if you need some time to yourself drop them off during Parents’ Morning Out! They have tons of classes available for all age range. Be sure to use your Shop Durham card to get 10% off retail purchases and Paint-it-yourself projects. Have them pick out a plant they can take care of! Whether you’re a gardener or a plant enthusiast that can’t keep anything green alive, Durham Garden Center is for you. Not only are they super friendly and helpful when you pop in, they also host educational workshops and many of them are FREE! Bonus: Use your Shop Durham card to get 10% off your purchase. Life would be much duller without Parker & Otis. I always find something so very ‘Durham’ here and a greeting card that makes me laugh out loud. They have a great toy section that will keep the kids busy. I always let my little guy have a special treat like a giant cookie and pick out a book. Duke Chapel is at the very center of the Duke University. You have to see its breathtaking beauty in person to truly appreciate it. It’s doors are open for you to visit 8 a.m. to 10 p.m. Walk over to the Brodhead Center afterwards for lunch or dinner. It’s food court style with tons of great options. Not just for students! Sarah P. Duke Gardens has a classroom with a variety of programs for kids and families. They have a open class in the learning laboratory for ages 3 and up on Tuesdays 1pm-3pm and other classes available like a free drop in Nature Storytime for ages 3-5. Got more kid-friendly things to do that we should know about? Send us a message!